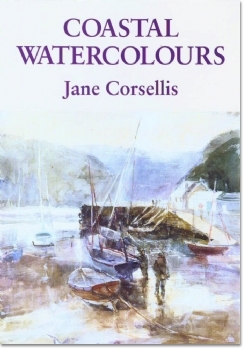 Jane Corsellis, a highly respected watercolourist and oil painter, is a member of the New England Art Club, the Royal Cambrian Academy and the Royal Society of Painters in Water Colours. In this video, she concentrates on the Pembrokeshire coastal scene, making a series of quick, boldly executed impressions on site. Some of these she uses later as the basis for larger paintings while others she develops more fully in the studio. Sometimes she feels the need to gather more information or refresh her memory and returns to the scene. If, on reflection, she is dissatisfied with some passage in her work, she may make fairly drastic alterations with the aid of a wet sponge, a practice usually disastrous in the hands of the inexperienced, but her skill is such that virtually no damage is caused to the surface of the paper. 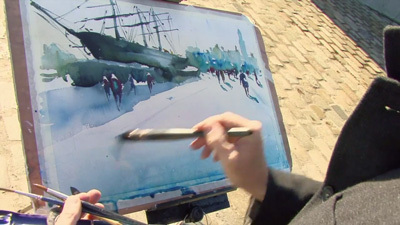 Her watercolour technique is an individual one, though, in fact, one shared on occasion with such giants as Turner and Cotman. 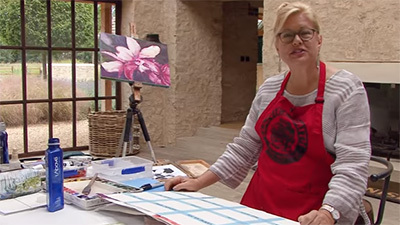 She often applies a loose wash of white gouache to her paper and when the surface has dried, she paints over it with quickly applied washes of pure watercolour so that the opaque underpainting is not disturbed. She does not mix the white gouache with her colours, but adds it here and there to capture the effects of light. She generally uses a Chinese type brush, which carries a generous wash and tapers to the finest point. She holds it towards its end, wielding it with confidence and panache to produce bold and expressive images. She uses a small paintbox with double pans, which she replenishes with tube paint prior to use, so that responsive pigment is always available, and nothing is wasted. 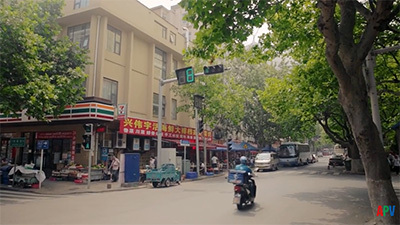 She has an excellent feeling for colour, and although she rarely mentions the pigments she is using, her effects are often subtle, with a tendency to cool rather than warm colours. Her brushwork is bold and confident and she omits inessential detail whenever she can, concentrating instead on capturing the effects of atmosphere and light. Her subjects in this video are attractive Fishguard, Newport harbour and beach scenes, and she succeeds in capturing their feeling and atmosphere boldly and effectively. 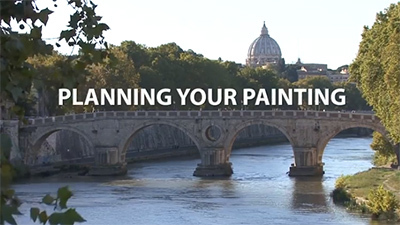 This video will be of particular interest to watercolourists dissatisfied with their technique and results, and looking for an exciting new approach. 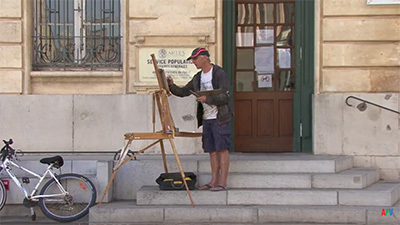 Although watercolour is an excellent medium for plein air work it nevertheless has a reputation for being difficult to control, especially when speed is an important factor. 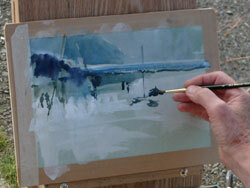 But watercolour is surprisingly versatile and, as Jane Corsellis demonstrates in Coastal Watercolours can be controlled by adopting particular techniques, or perhaps combining watercolour with other media. Jane always works from direct reference to the subject, usually beginning with studies made on site and then developing more resolved paintings in the studio. 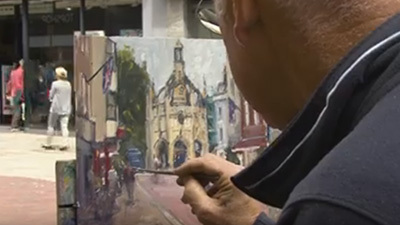 Her methods vary according to the subject matter and prevailing conditions, but generally she starts with loose washes to get a feeling for the scene and then works into these to establish definition and detail. Her video is full of sound advice and interesting, inspirational demonstrations. 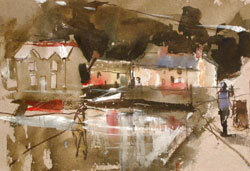 Jane paints at her Pembrokeshire studio and at various locations along the nearby coast, mostly around Newport Beach and Fishguard Harbour. 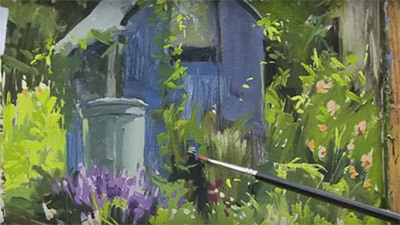 Working in sketchbooks and on different types of paper, her techniques include the use of white gouache and fibre pens as well as a variety of brush and wash effects.